Cat was born in Zambia. She went to school in Scotland and Yorkshire: she read a lot, and wrote a bit, and dreamed of not having to go to school. She went to university in Edinburgh and studied things that happened long ago: she read a bit, and wrote nothing, and dreamed of never having to work for a living. She also ate lots of toast and tomato soup. Within two weeks, Cat had landed an awesome job in publishing. She started off marketing children’s books, and then moved on to writing and editing them. She wrote books about pirates and sharks and Aztecs and cowboys and weather and even one about London (without mentioning chewing gum OR vomit). This was fun and all, but Cat yearned for more, so she started writing The Novel (aka Entangled). When she finished it, she signed with agent Julia Churchill and publisher Quercus. She won the Redbridge Teenage Book Award 2012. Cat now lives in Scotland, writing books, wearing hats and fussing cats. 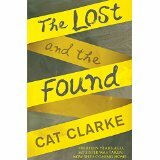 Find Cat on Twitter @cat_clarke and at http://www.catclarke.com. 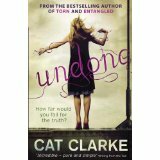 Undone: Jem Halliday is in love with her gay best friend. Not exactly ideal, but she’s learning to live with it. Then the unspeakable happens. Kai is outed online … and he kills himself. Jem knows nothing she can say or do will bring him back. But she wants to know who was responsible. And she wants to take them down. 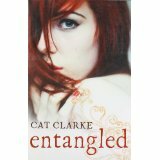 Entangled: The same questions whirl round and round in my head: What does he want from me? How could I have let this happen? Am I going to die? 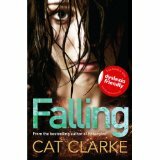 17-year-old Grace wakes up in a white room, with table, pens and paper – and no clue how she got there. As Grace pours her tangled life onto the page, she is forced to remember everything she’s tried to forget. 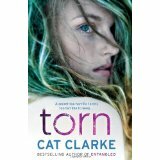 There’s falling hopelessly in love with the gorgeous Nat, and the unravelling of her relationship with her best friend Sal. But there’s something missing. As hard as she’s trying to remember, is there something she just can’t see? Grace must face the most important question of all. Why is she here? 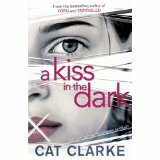 A Kiss In The Dark: When Alex meets Kate the attraction is instant. Alex is funny, good-looking, and a little shy – everything that Kate wants in a boyfriend. Alex can’t help falling for Kate, who is pretty, charming and maybe just a little naive… But one of them is hiding a secret, and as their love blossoms, it threatens to ruin not just their relationship, but their lives.